The British Airways advertising campaign, launched in June, to promote the Olympics was a bit mysterious. Its slogan was “Don’t fly. Support Team GB”. BA is official airline partner of the London 2012 Games, Team GB and ParalympicsGB and it is sponsoring the games to some huge financial extent. But why a campaign asking Brits to stay at home during the summer, and not fly? Surely this must be admirably self sacrificing, and public spirited? Not a bit of it. Just a cynical use of manipulation of people’s sense of patriotism. They are only asking that flights and holidays with BA are postponed to a later date, as they are already full over the summer with Olympic travellers. So this is just to get more travellers. And now there is a new scheme to get more long haul passengers after the Games, by giving cash returns if travellers back a certain athlete and they win a medal. They are now pushing the Caribbean hard for this autumn. So cynical. So BA. British Airways ‘Home Advantage’ ads urge public to get behind Team GB and stay at home during the Olympics. This Summer, the greatest sports event on Earth comes to London. And our best sportsmen and women have a once in a lifetime opportunity, to compete at the highest level with the whole country behind them. That’s why we’re asking the nation to join together, to give our athletes the greatest home advantage we can give them. It could be the difference between silver and gold. This Summer, there’s nowhere else in the world to be. Every day of the Games that one of Team GB win a medal, Executive Club members can earn extra Avios. Find out more. Terms and conditions apply. British Airways launches cashback campaign. With just two days to go, and as thousands of visitors descend upon London for the 2012 Olympics, British Airways will be rewarding customers who stay in the UK to cheer on Team GB and Paralympics GB. The cashback rewards on holidays are for travel after the London 2012 Olympic and Paralympic Games and in line with specific athlete wins. British Airways will feature a new offer based on a chosen athlete, valid for a limited period and in line with their schedule in the London 2012 Games. Each offer will also have a money back incentive dependent on the performance of the athlete. Customers can book an offer via the dedicated campaign page on ba.com and later if the featured athlete wins a medal, cashback will be given on the booking in relation to the medal won. A maximum cashback reward is given based on the highest medal won. For a Gold medal the cashback will be £100 per booking, for a Silver medal £75 per booking and for a Bronze medal £50 per booking. The airline is currently supporting Jessica Ennis, World and European heptathlon gold medalist and if customers book an all-inclusive Caribbean holiday for seven nights they can win cashback on their holiday if she wins a Gold, Silver or Bronze medal. Twenty-five favourite all-inclusive Caribbean holidays are on offer with flights plus seven nights all-inclusive accommodation. Holidays in Cancun including flights and seven night’s all-inclusive accommodation are included for travel on selected dates between September 10 and October 14, 2012 (travel dates vary by offer). The Caribbean holiday deals are available to book until July 24, 2012. Visit ba.com/winningdeals for more information. 10,500 Olympic athletes from 204 nations will compete in 34 stunning venues in and around London, over the 17 days in which the Olympics are played out. June 11 – (excerpts) …. British Airways has released a study showing that this year Brits are staying home and postponing vacations and personal engagements to support Team GB at the Games. 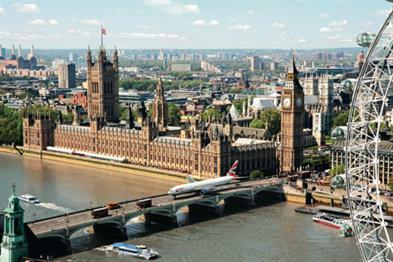 British Airways is official airline partner of the London 2012 Games, Team GB and ParalympicsGB. ….the study finds that 40% of Brits have already juggled their holiday specifically around the London 2012 Games. 10% of people have even cancelled their holiday, while 10% have held back from booking a break this year to back the team. British Airways has launched the ‘Flying Britain Home’ campaign, offering a quarter of a million pounds worth of flights to British expats that live abroad to fly back for the Games. Also 50 flights have been offered to Team GB and ParalympicsGB athletes to bring their friends and family home to cheer them on. Luisa Fernandez, British Airways sponsorship manager, said, “It’s such a proud time to be British and we’re hoping to get the nation into the spirit by flying hundreds of ex-pats back to the UK to celebrate the summer of sport. Or if not postponing, how to find the “best sports bars abroad” (having flown there on BA). BA estimates it will be providing hundreds of flights to bring home ex-pat Brits for the Games, while it will broadcast live Games action at Terminal 5, and outbound passengers will be offered booklets with details on athletes and a guide to the best sporting bars abroad. Posted: Wednesday, July 25th, 2012. Filed in General News, Recent News.